The puzzle has 17152 solutions, however when you cut out rotations and reflections the number goes down to 536. 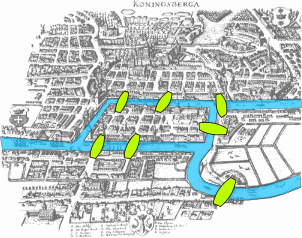 A famous example of a mathematical problem is the Seven Bridges of Königsberg, a problem devised by Euler where you had to cross the seven bridges in the Prussian city (known today as Kaliningrad) without crossing any bridge more than once. It's actually possible to predict if a shape can be drawn without taking your pen off the paper. It's all to do with the "nodes", the areas where two or more lines come together. You need to count the number of nodes with an odd number of lines connecting them, and the number of odd nodes determines if the drawing is possible or not. 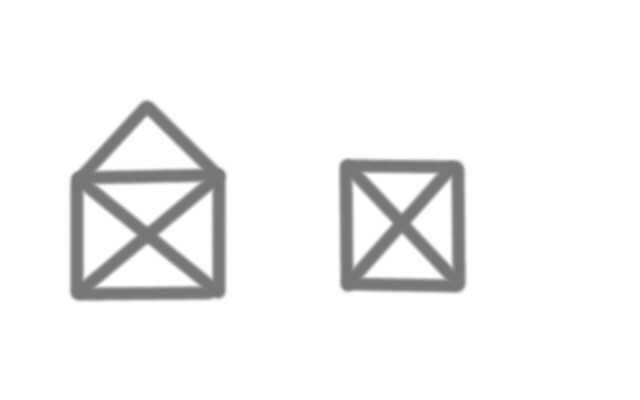 If a shape has 0 odd nodes, it can be drawn in one line from any point on the shape. If a shape has 1 odd node, it can be drawn in one go as long as you start or finish at that odd node. If a shape has 2 odd nodes, it can be drawn in one go as long as you start at one and finish at the other. If a puzzle has 3 or more odd nodes, it cannot be drawn without taking the pen off the paper or going over an existing line. The closed envelope above has 4 odd nodes and so cannot be drawn in one go. However, the open envelope only has 2, and so it can easily be drawn without taking your pen off the paper. 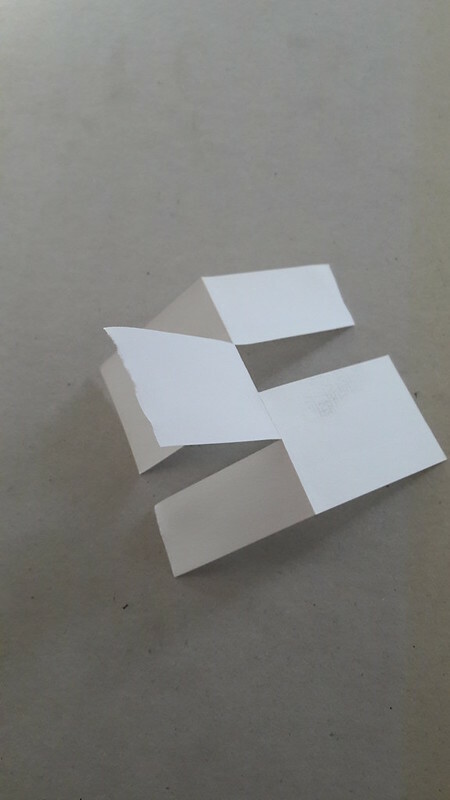 Recreate this from one single piece of paper; no glue nor sticky tape. Make this equation right by moving just one match stick. There are a couple of answers to that matchstick one. The supposedly "correct" answer is that you move the last stick from the top line and put it above the answer on the right to create "22/7 = π", but it's not technically right since 22/7 does not equal pi exactly. The other "correct" version I've seen is that you remove one of the sticks from the second X on the top line to create "XIIII", which makes "14/7 = 2". But this also doesn't work because a) taking off that stick would leave "X/III", and b) 14 is never expressed as XIIII, only XIV (although oddly IIII is used for 4 on some clocks). So my answer would be to take the final match from the top row and put it diagonally over the equals sign to create the "not equals" sign, and thus you get the correct equation "22/7 ≠ 2". As for the other puzzle, I have no paper, but I'm guessing an optical illusion and clever lighting is involved. b) 14 is never expressed as XIIII, only XIV (although oddly IIII is used for 4 on some clocks). Do we know why clock faces use IIII? Edit: Not only am I lazy, but I'm probably wrong too. 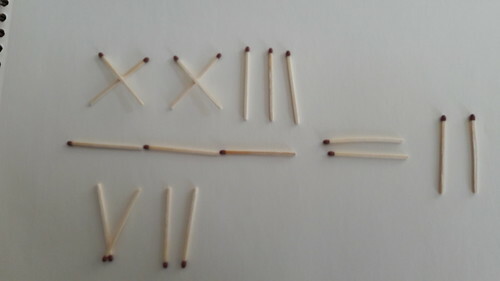 You pick up the matchstick forming the second "I" of "XXIII". Then you light it and set fire to the third "I". Finally you blow it out and put it down next to the "II". my answer would be to take the final match from the top row and put it diagonally over the equals sign to create the "not equals" sign, and thus you get the correct equation "22/7 ≠ 2". Is in general taken as the right answer. Yorz, I see how to do the paper one. Will prove it when I get home. I think I know how to do the paper one, but it only works if you photograph it from that particular angle. Darn, I forgot. Will try to remember today.